In the first month of my freshman year at Temple University, I picked up a folded green brochure in the Student Activities Center. It was the schedule for the Annenberg Cinematheque at the University of Pennsylvania, programmed by Amos Vogel. I knew nothing of Vogel, but I quickly noticed that they were hosting a free series of documentaries. Since these included some silent films I had read about in the catalogs of Blackhawk Films (a manufacturer of 8mm and 16mm film prints of mostly silent classics), I decided to go, alone. That same afternoon I drove for the first time to the Penn campus and found my way to a small 16mm screening room in the basement of the Zellerbach Theater. There I sat in the dark with a few other people and watched Berlin: Symphony of a Great City in excited total silence — it was not unusual in those days to see silent films projected with no accompanying music, especially at campus screenings. I loved the film and almost didn’t mind when I returned to my car to find my first parking ticket. Besides my new film history classes at Temple, I had not attended anything like this before. I’d been a pretty provincial Northeast Philly kid, rarely leaving the immediate neighborhood and just learning to drive in time to attend college. My world was quickly getting a lot more interesting and this first visit to West Philly to see these beautiful views of an earlier world still seems very romantic in my memory. I came back soon for another film in this free afternoon documentary series, Man With a Movie Camera. Then I came back and gladly paid admission for their evening films, with some new friends. Ray Murray I had met in my very first class at Temple (“The Image of Women in Film,” taught by Joan Mellen). Ray told me he was a projectionist at TLA Cinema on South Street, which I’d heard a lot about in high school but had somehow yet to visit. When Ray heard I had a car, I was quickly recruited to help distribute TLA schedules around the city. Soon I found myself driving all around the city with a trunk full of schedules. Meanwhile, we made plans to see Keaton and Godard retrospectives at Vogel’s Cinematheque. Ray brought his friend Danny Miller, and we saw challenging films like La Chinoise and Weekend. Amos Vogel was still just a name on the program to me, but he was steering us towards the good stuff. A little bit later I randomly found Film as a Subversive Art on a bookstore shelf — a shocking discovery in its own right, as anyone who has perused its graphic photos is aware. I remember feeling proud realizing that the author was active in our own city and that I had attended his film series. The next time I noticed Vogel’s name was a few years later, when he hosted a Saturday afternoon TV program of short films on WHYY. This is where I first got to see the now celebrated early punk rock documentary Punking Out. The choice was surprising for Channel 12, but typical of Vogel’s lifelong adventurous taste. It would be great if these programs, which featured Amos introducing the films on camera, could be seen again. Somehow I knew that Vogel had earlier created a film society in New York called Cinema 16, but the magnitude of this achievement eluded me until much later, when Michael Chaiken programmed a pair of Cinema 16-inspired screenings for the Philadelphia Film Festival, centered around the Vogel documentary. Michael also turned me on to Scott Macdonald’s great book about Cinema 16 (published by my alma mater). I read with amazement how Vogel regularly attracted audiences of thousands to screenings of underground and alternative films…in the 1940s! By now I was doing my own film series, and I knew first-hand how difficult it is to get an audience of merely 100, in our supposedly more sophisticated time. 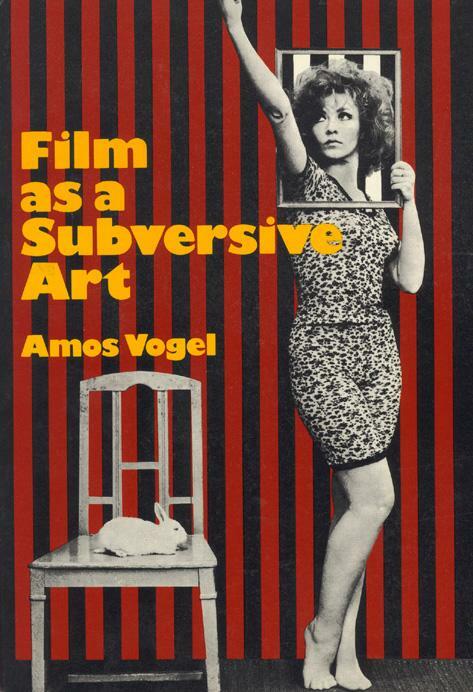 I think this is the most fascinating part of Vogel’s career, and all fans of Film as a Subversive Art owe it to themselves to also read Cinema 16: Documents Toward a History Of the Film Society, and learn where Amos Vogel was coming from. My early college years were an exciting time, exposing me to lots of places, people and culture that had not previously penetrated my safe environs North of Cottman Avenue. The Annenberg Cinematheque screenings are a great memory and undoubtedly influenced me and my friends. Today Ray Murray is the President of TLA Entertainment Group. Danny Miller is the Co-Executive Producer (with Terry Gross) of NPR’s Fresh Air. My own modest (in scale if not ego) contribution to local culture, the Secret Cinema, may be less far reaching then those guys’ projects, but has somehow lasted for 20 years. We were just three people in a vast audience of cinephiles, cultivated over many decades, whose eyes were opened a little bit wider by Amos Vogel. Jay Schwartz has been running The Secret Cinema for over 20 years. Gee, this guy is asked to write an appreciation of Amos Vogel, but he mainly writes about himself! I for one would be much more interested to read remembrances by Michael Chaiken, who actually knew Vogel. How about it? This is a touching recollection of an important era and you could tell Jay’s passion for film and for what Amos Vogel had achieved throughout. It was a different time, obviously, but, luckily some people have fond rememberances of it.